My previous post on Cape Verdean Singer Neuza, resulted in a trip to the AME, The Atlantic Music Expo in Cape Verde. As impressive as the local talent was, there were plenty of great acts drawing from the environs. I'm working on a longer mini-doc on the event (stay tuned!) but want to present one of my favorites right away, a singer songwriter from the island of Réunion. 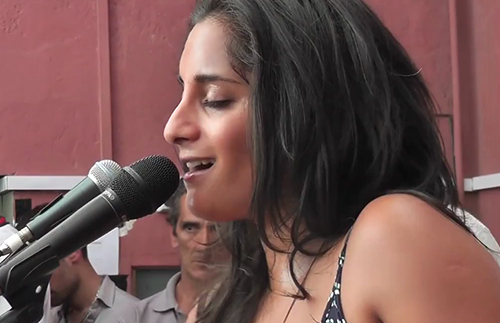 Maya Kamaty is the daughter of Gilbert Pounia, front man for the band Ziskakan, one of the most popular groups on the island. They create music that is a heterogeneous blend of European, African and Indian elements (representing the population of the island) with a tasty dose of modern pop elements. So it is no wonder that Ms. Kamaty's music contains all of these elements as well. "Ziskakan" is, by the way, celebrating their 35 years in music together, no mean feat for a band. Although her songwriting is quite strong, I am presenting her performing a song her father wrote, "Vavang." The two actually collaborate on occasion, but I can assure you Ms. Kamaty is a fine songwriter in her own right, and I'll present one of her originals at a later date. In case you are wondering, she is playing a "kayamb" - a flat, square rattle made from sugar cane tubes and seeds, and a common instrument in both Maloya and Sega music, the two main genres of the island.